What happens when you combine two of the most popular hangover cures? 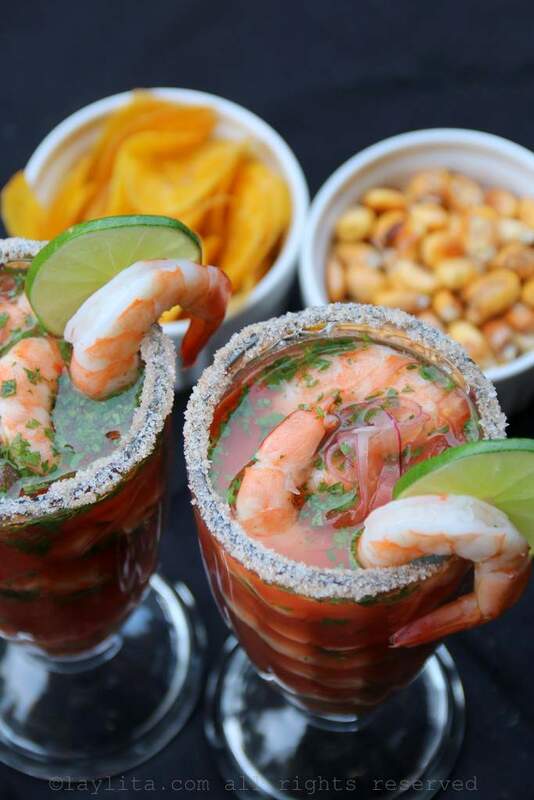 You get a mouthwatering Bloody Mary Shrimp Ceviche, or a Bloody Maria ceviche – if you use tequila instead of vodka. 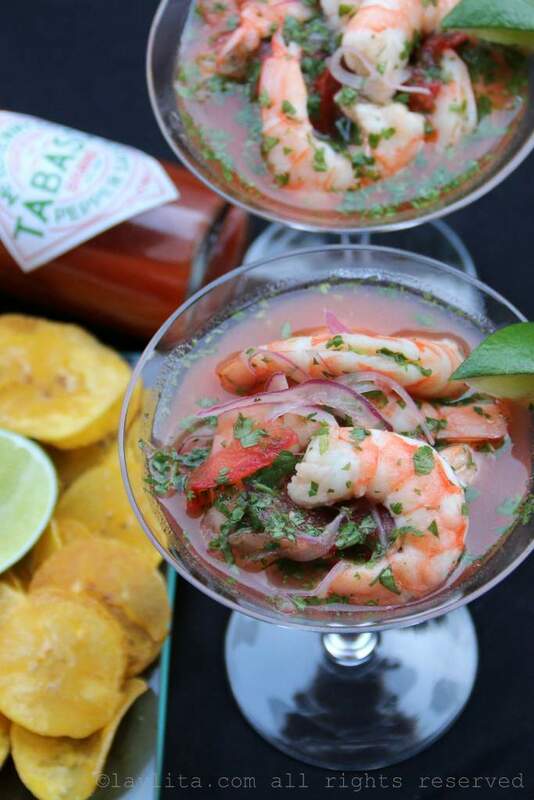 This Bloody Mary ceviche recipe is made with fresh tomato juice, orange juice, lime juice, Tabasco hot sauce, shrimp, red onions, tomatoes, cilantro, and vodka/tequila to taste. 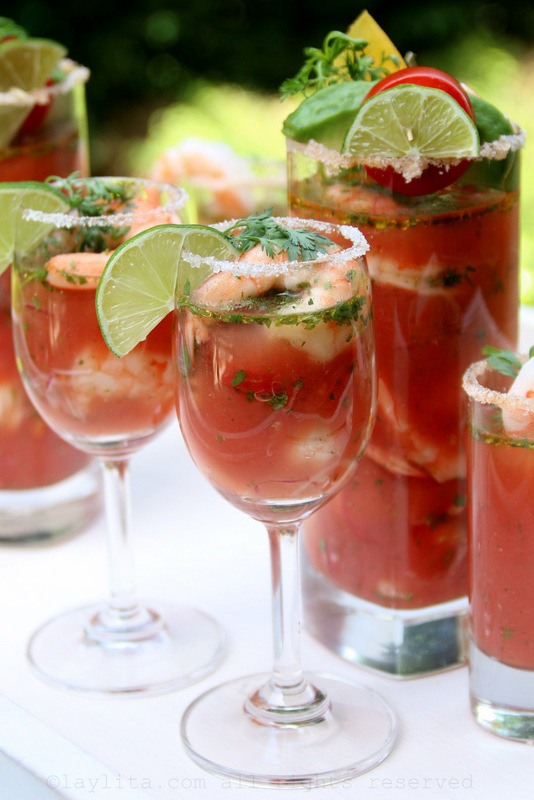 Ceviche, in this case shrimp ceviche, is well known in Latin America as a great hangover cure. 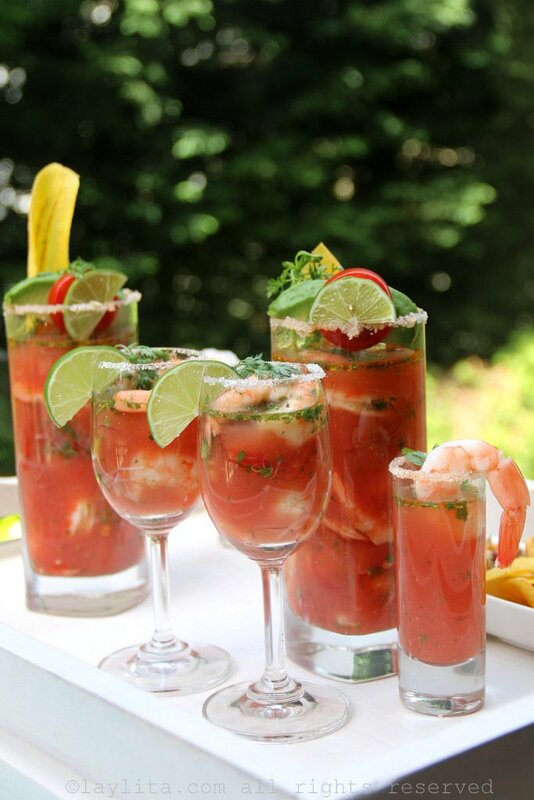 A Bloody Mary cocktail has a similar reputation in the US/Canada/Europe (and probably other places). 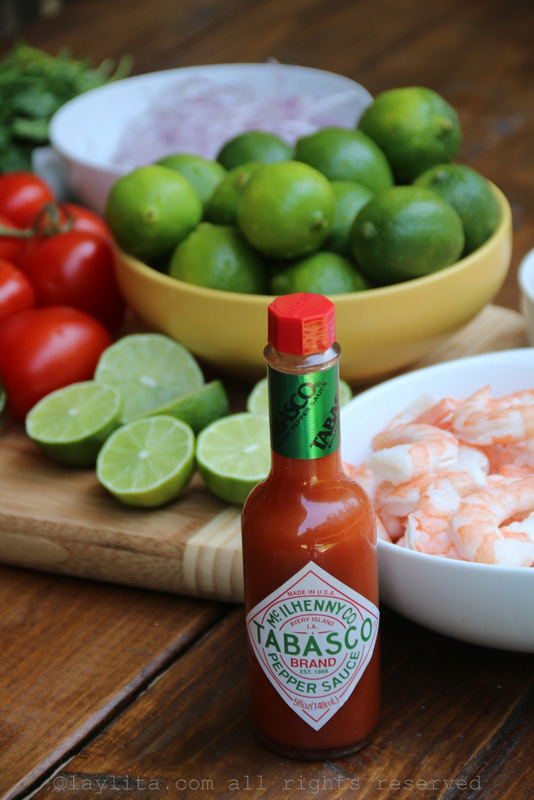 Mix the two together, they already share some similar ingredients, and you have this refreshing shrimp ceviche Bloody Mary. One of the things that makes ceviche so good, at least in my Ecuadorian opinion, is the delicious juice that marinates the ceviche. That mix or juice base can easily be adjusted with a few classic Bloody Mary spices and flavors to become a great cocktail. In Spanish, I would call this combination a guaranteed “levanta muertos”, which translates as something that will raise you from the dead. 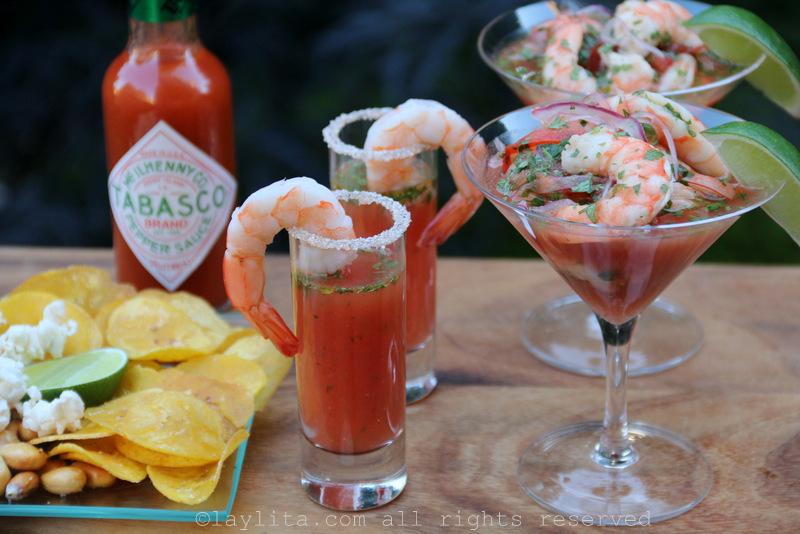 Bloody Mary shrimp ceviche recipe made with fresh tomato juice, orange juice, lime juice, Tabasco hot sauce, shrimp, red onions, tomatoes, cilantro, and vodka to taste. 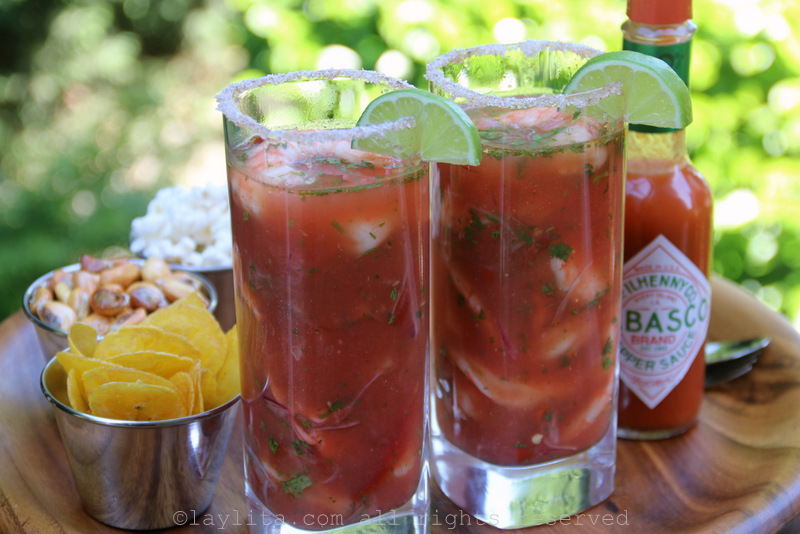 Use tequila for a Bloody Maria, or leave out the alcohol for a refreshing savory cocktail with ceviche flavor. Strain and save the mix in the fridge until needed. Rub the onion slices with ½ tablespoon of salt and rinse well. 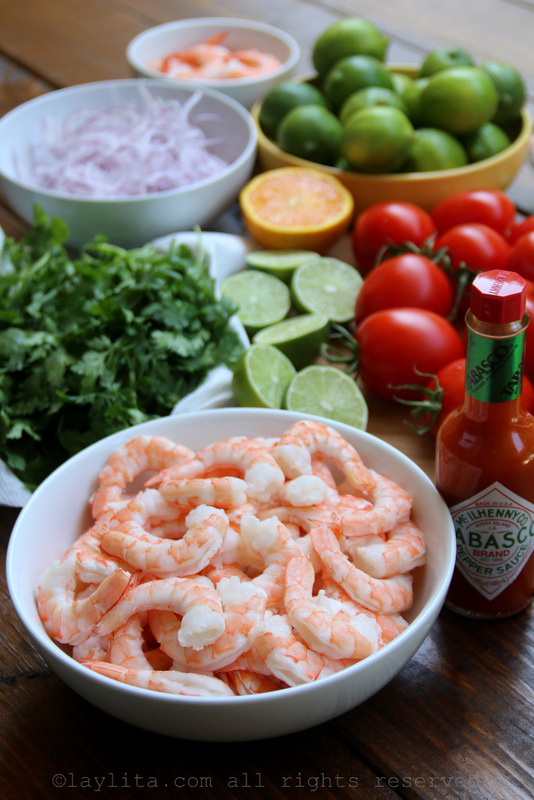 Combine the cooked shrimp, sliced tomatoes, sliced onions, lime juice, cilantro sprig and a teaspoon of salt. Let the ingredients marinate for about 30 minutes (in the fridge). Remove the cilantro sprig, and add the chopped cilantro, oil, and the strained Bloody Mary juice. 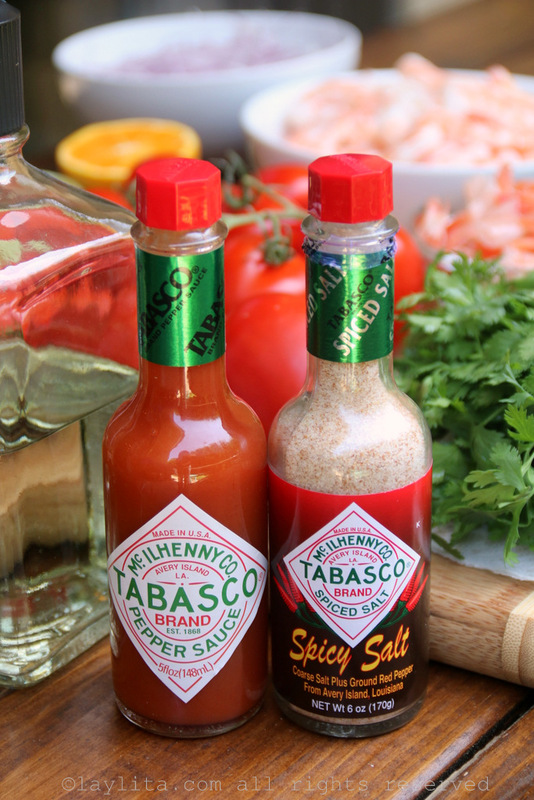 Mix well, taste and add Tabasco/salt to taste. Refrigerate for 1-2 hours before serving. 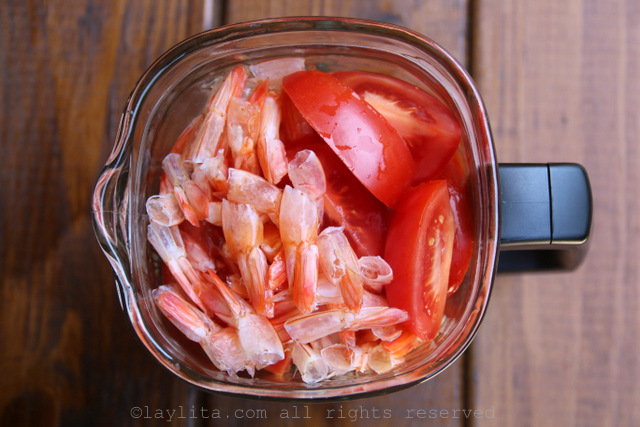 If you are adding alcohol and/or want to separate the liquid from the shrimp, use a slotted spoon to remove the shrimp/tomatoes/onions from the mix and place them in a separate bowl (keep a bit of liquid with the shrimp so that it doesn’t dry out). 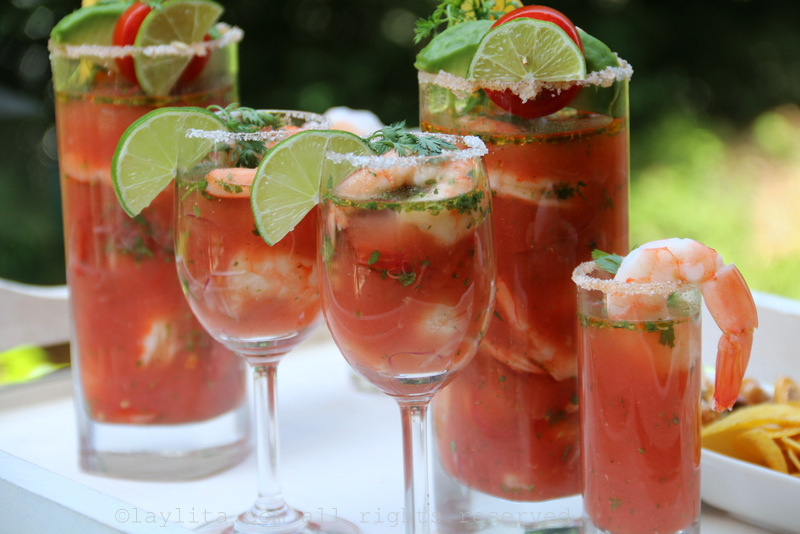 Serve in a tall glass all mixed together with your choice of garnishes. 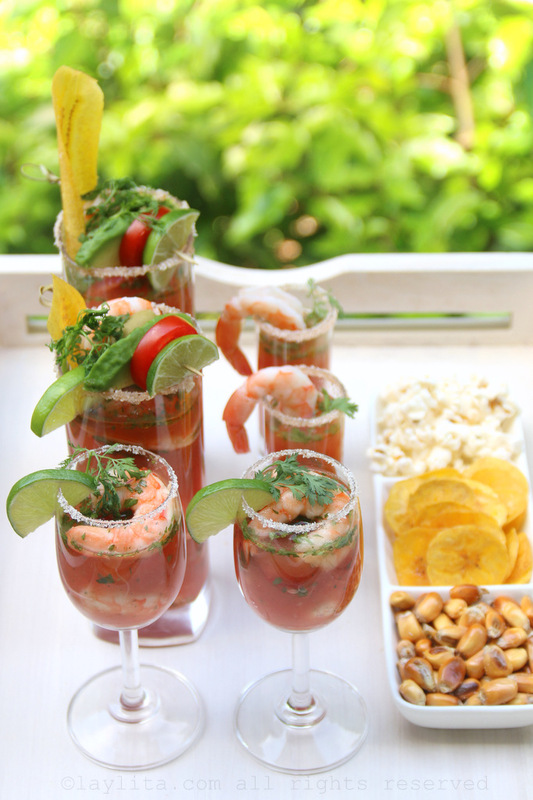 Or serve the Bloody Mary juice in shot glasses with the shrimp ceviche on the side. 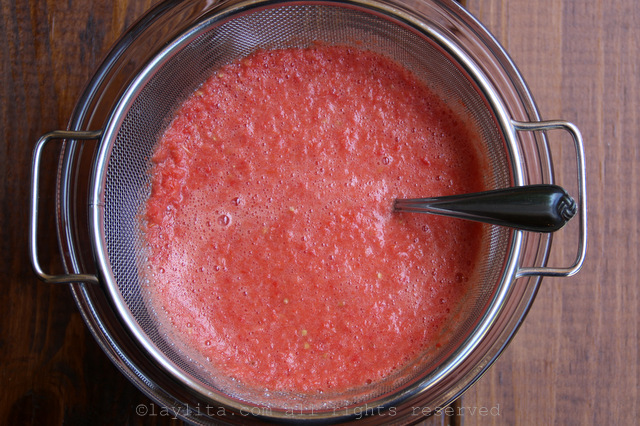 For the juice mix, I blended fresh tomatoes with some orange juice, Tabasco, ketchup, and some of the shrimp peels. 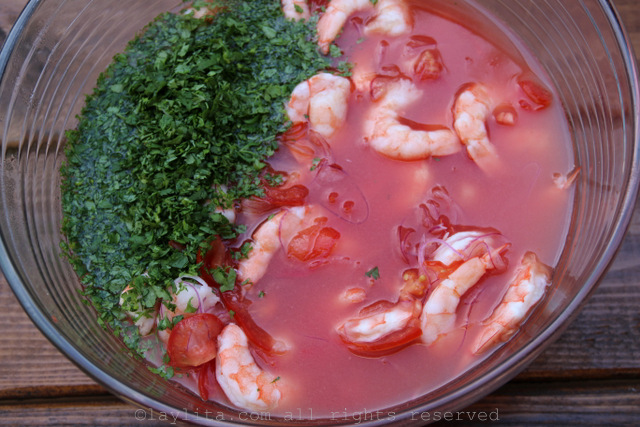 If you cooked the shrimp yourself, you can also add a few tablespoons of the broth to the mix. 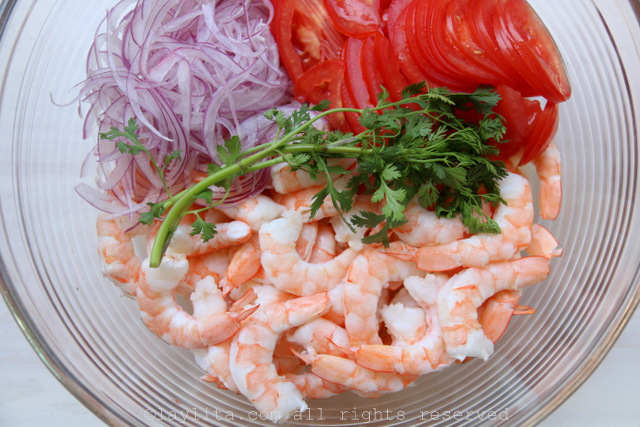 If you bought fully cooked peeled shrimp, then instead of the skins/broth you can add a couple of whole shrimp. It will just give the mix a slight shrimp taste. 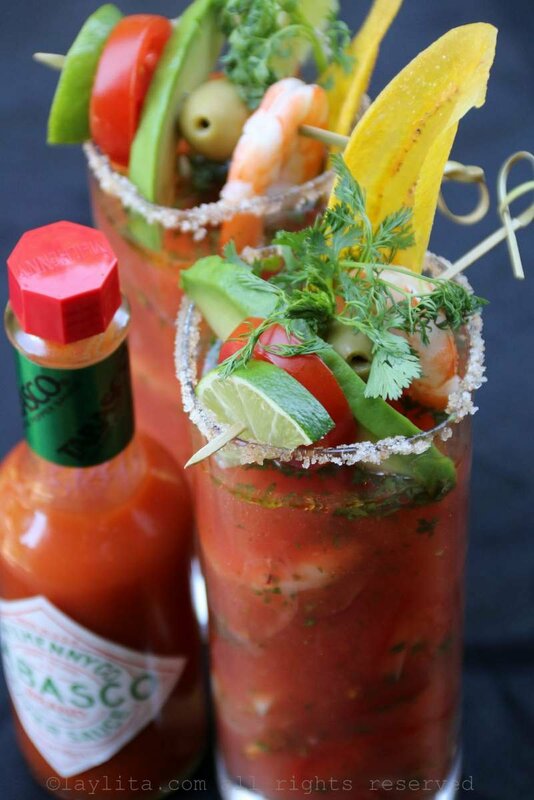 You can also include some of the traditional Bloody Mary seasonings like Worcestershire sauce and horseradish if you wish. 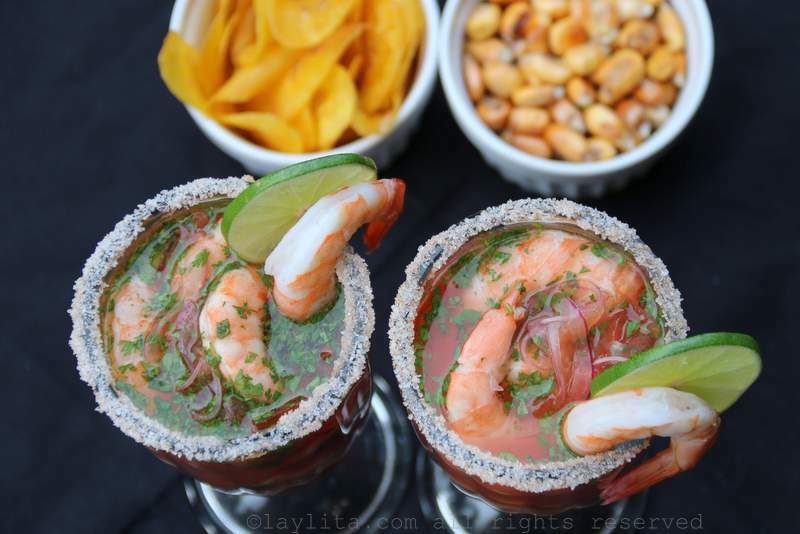 The good thing, from the personal viewpoint of someone who is aging and tries to avoid hangovers at all cost, is that you don’t need to have a hangover to enjoy this Bloody Mary ceviche. 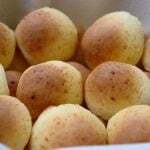 Not to mention that there are many who consider the whole hangover cure thing to be a myth – but based on memories of those old times, when you have one of those “santas borracheras batman” hangovers, you cling desperately to the idea that something can provide relief. But, in real life, you will probably appreciate this just as much without a hangover. 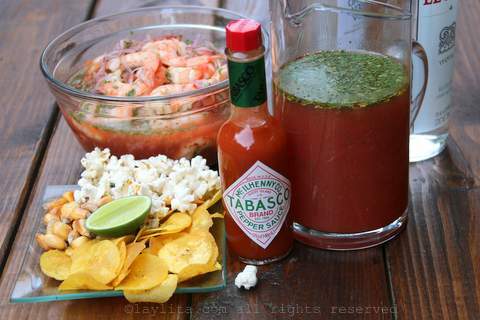 And if you don’t want to add vodka or tequila to this Bloody Mary shrimp ceviche, it will still be just as good. 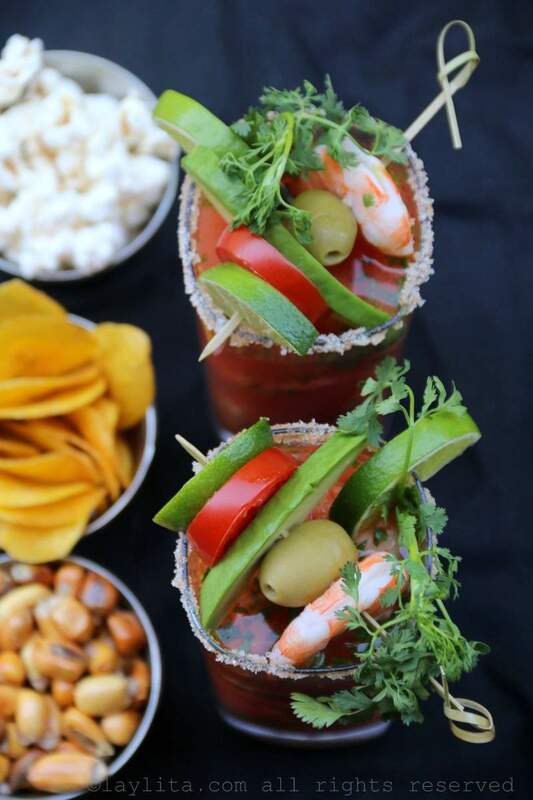 For a brunch or lunch party, you can set up a Bloody Mary ceviche self-serve bar station with the garnishes and alcohol on the side, so that your guests can add it (or not) according to their preference. I love garnishes! 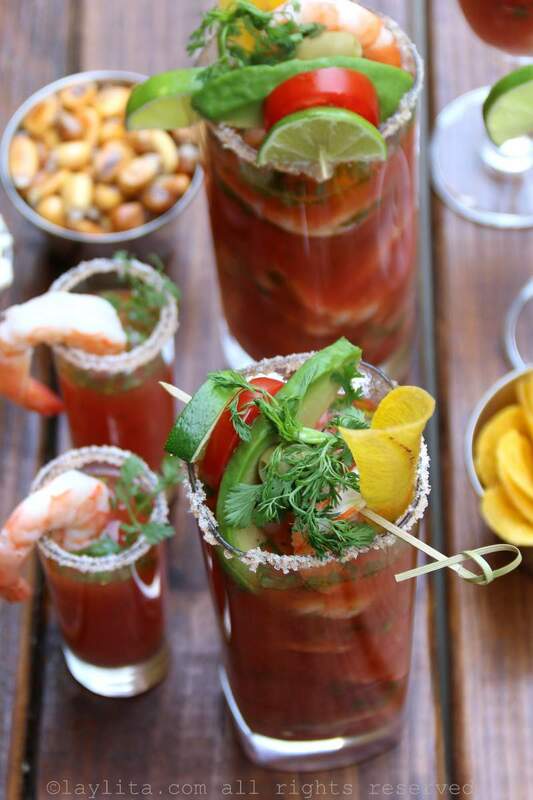 And both ceviche and Bloody Marys are a dream come true for a garnish lover. 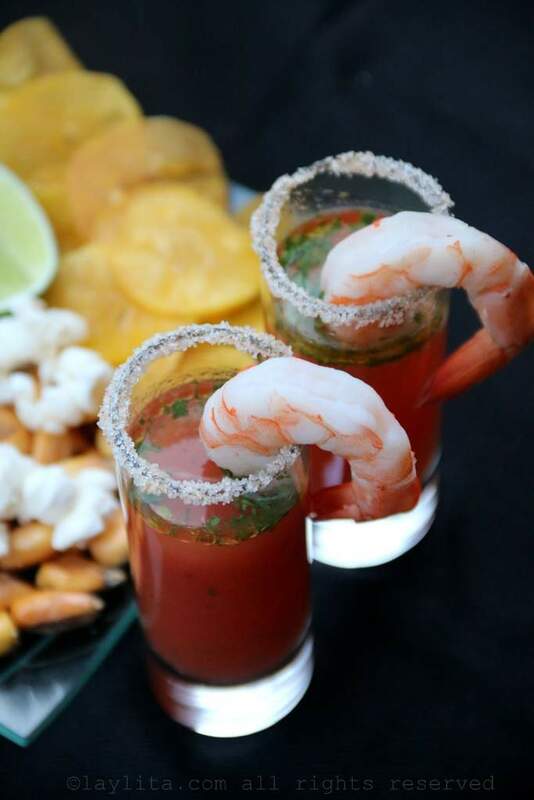 Some garnish options for the Bloody Mary Shrimp Ceviche include slices of limes, tomato, avocado as well as olives, shrimp, cilantro sprigs, chifles or green plantain chips, popcorn and/or maiz tostado (cancha/chulpi corn nuts). 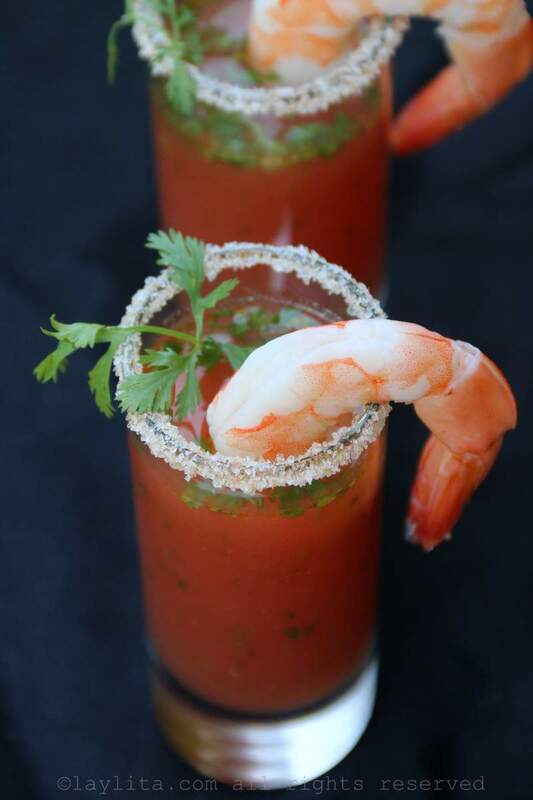 I also used spicy Tabasco salt to decorate the rims of the glasses. 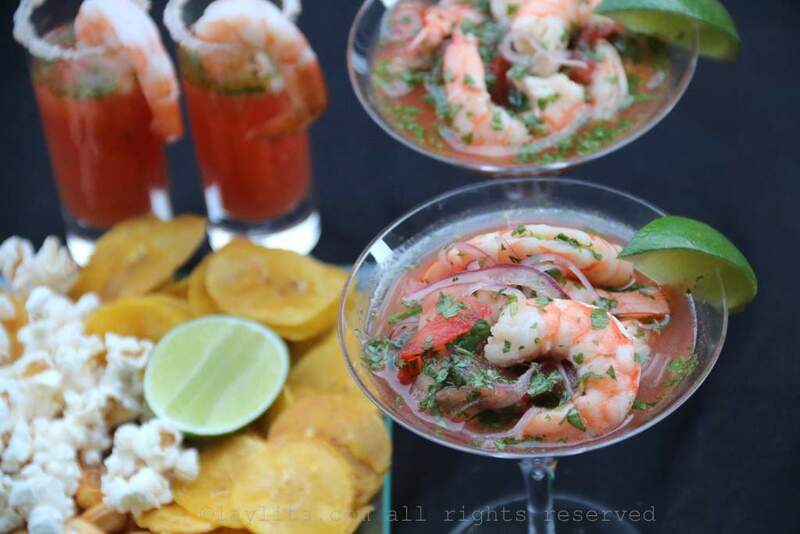 This ceviche cocktail can be served with the shrimp and the juice mix mixed together in tall glass and eaten with a spoon, or you can serve the liquid in shot glasses with the shrimp on the side in a martini glass. Salud and buen provecho! 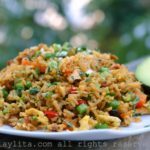 Disclosure: Thanks to Tabasco for sponsoring this recipe. All photos, recipes, opinions, and ideas are 100% my own. wow, never thought about it. me encanta! we will try it out soon.